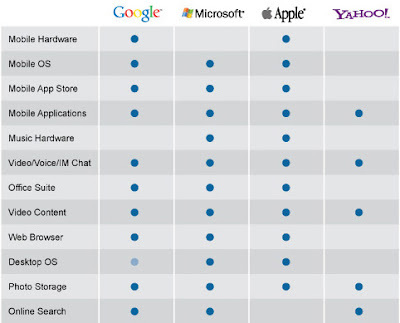 We all love a good debate about how the tech giants of today are competing with each other, but rarely do we get a handy reference sheet like this to point people to. 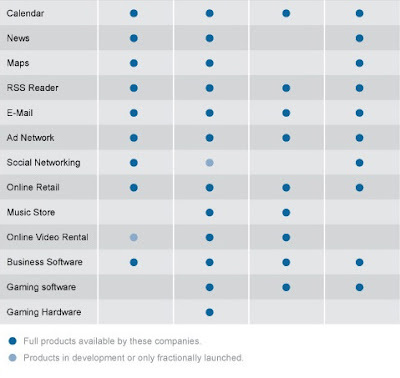 Nick Bilton of the New York Times has put together a segment-by-segment comparison between America's tech heavyweights, which does a fine job of pinpointing who competes with whom and where. We find the gaps in coverage more intriguing than the overlaps, though, with Microsoft's only unticked box - mobile hardware - raising habitual rumors of a Pink phone. Apple's absence from the provision of mapping services might also soon be at an end, given the company acquired map maker Placebase in July of last year.